Dow Jones at 10,000: Is History Repeating Itself? First there was the dotcom bubble. When it deflated, the U.S. Federal Reserve set interest rates at historic lows for far too long, in turn giving birth to a new asset bubble; residential real estate in America. We all know what happened to that asset bubble, and our world is still gripped with the consequences of its implosion. How has the Fed responded? By establishing a near zero interest rate policy (ZIRP), which in turn has created a new asset bubble; equities. With the Dow Jones surging past 10,000 for the first time in a year, and Wall Street handing out executive bonuses at a rate that exceeds the previous best year for their self-congratulatory excess, 2007, by 10%, one would think that the global economic crisis is over. Perhaps we are just witnessing a new and potentially more dangerous asset bubble being inflated by government bailouts and monetary policy courtesy of the Federal Reserve that has gone berserk. With the U.S. dollar plummeting like a lead weight falling off a cliff, and banks providing depositors with virtually no interest, it seems that it is a matter of policy to encourage stock market trading and speculation. 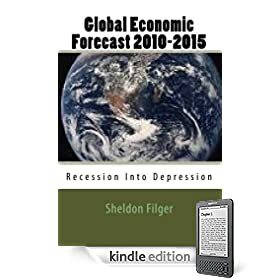 The question that must be asked is this; when accelerating levels of unemployment, contracting consumer spending and elevated levels of loan foreclosures make it clear that the real economy is still in deep crisis, how sustainable will this latest asset bubble prove? I think recent history has already provided an answer. U.S. Deficit To Hit $1.5 Trillion in 2011!